Looking for the perfect gift for the RV lover in your life? Look no further! Here at Wilkins RV, we have a huge selection of popular RV gifts in our RV Parts department at limited time sale prices. Hurry in now through December 20th to take advantage of amazing deals on a wide variety of RV parts, accessories and fun gifts for that hard to buy for camping enthusiast. 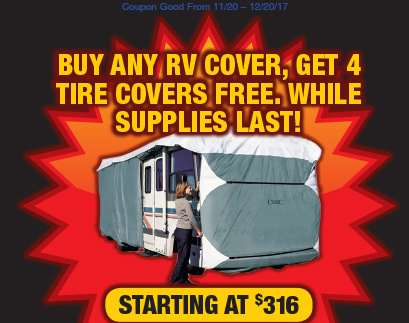 Plus, purchase any RV cover and get 4 tire covers free! Protect your tires from the elements and extend their life, giving you greater peace of mind during your travels. Don’t wait! Supplies are limited while they last! Still not sure what to get for that special RVer? Gift Cards make great stocking stuffers! Purchase a Wilkins RV Parts Gift Card and get a 10% discount! What a great deal! With so many fun RV accessories to choose from, the lucky RV lover in your life will have a blast choosing the perfect must have item to make their next camping trip extra fun. Contact Us at one of our four New York locations parts departments for special requests on hard to find items. Don’t let these deals get away! 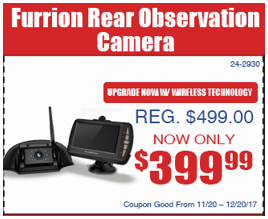 Hurry in to one of our Wilkins RV locations in Bath, Churchville, Syracuse or Victor, NY before December 20th for amazing savings on the perfect RV gift!